At Barr Camp in Colorado, we also do a lot of dishes. Like Grandma and I, those of us who live and work here don’t all do them the same way. I like to pre-wash things and stack them up neatly on the counter next to the dish pan. Others pile dishes in the sink or skip the pre-rinse altogether and head straight to the wash cycle. The task–take a dirty dish and make it clean–is singular, and yet we all have our own unique ways of accomplishing it. A psychology major could probably write a thesis on the personality traits displayed by the way one washes a dish. The same is true with running. The act itself is simple: pick one foot up, lift the other foot before the first foot hits the ground, repeat. Yet we all do it a little differently. Sure, it’s all running, but the style changes from one person to the next. Three years ago, after my first UTMB, someone told me that I ought to run with my head instead of my heart. While there was likely some truth to the comment, it also seemed a bit harsh and close-minded. Later that same day, someone else expressed to me that I just need to be myself. In everyday life, I am a lot of head. I think about things a lot. Sometimes it’s good and other times it cripples me. In running, I like to turn it all off, to run wild and free. Sometimes this gets the best of me and I pay for it. Lately I’m trying to learn the balance between head and heart. Leading into this year’s UTMB, I thought a good strategy would be to run the first part of the race with my head, and the last part with my heart. But my heart tugs hard, real hard. Now I’m not saying that I totally abandoned the plan. In fact, I felt like I did a pretty good job of running with my head and staying controlled. That is, until we got to La Fouly. Somewhere between there and Champex-Lac, my heart ran wild. I paid for it dearly and was unable to finish the race. But this article isn’t really about UTMB. It’s really about Grandma and the dishes, and learning how to be yourself. Learning to be yourself sounds easy, but sometimes we get distracted. We get caught up in trying to be what society pressures us to be or what we think other people want us to be. This doesn’t mean that we stubbornly and selfishly push our way through life with nothing but our own interests in mind. What it does mean is that we pay attention to our passions and gifts. We learn our strengths and weaknesses. We figure out what sets our soul on fire. Once we’ve done that, we run with it wholeheartedly. We take all of those things that are intrinsically us, and we live them out. We use them not only to fulfill ourselves, but also to help others. Whether you believe it or not, the world would not be the same without you. Not the you whom you think everyone else wants you to be, or the you whom you feel obligated to be, but the you who is truly and uniquely you. If you find that and live it out, I imagine that you’ll end up helping people, doing good things, and finding fulfillment. This all sounds really easy, perhaps too easy, but I struggle with it. One of the hardest parts is knowing that I’m not perfect, that I have flaws and weaknesses, things I need to work on. Surely I do things that annoy and inconvenience others, things that make me difficult to deal with. They may not be characteristic of who I want to be, but they exist. They are part of me and if me is who I am supposed to be, then where do the flaws fit in? Enter the art of self-improvement. It’s like the dishes and how we all have our own techniques when washing. We all run with our own style, and we all have a unique way of being ourselves. But sometimes Grandma’s disapproval is spot on, and we may need to turn the cold to hot to get the job done. Other times Grandma’s choice is just one option among many, and we can leave the faucet right where it is. Life isn’t about always or never changing. To always change is to be a chameleon who is constantly trying to blend in with his or her surroundings. To never change is to be a stubborn burro, refusing to give an inch. Neither of those are what I want to be. As a runner and a person, I long to be somewhere in the middle. I long to stay true to myself, yet taking the steps necessary to improve upon my weaknesses. I want to continue to run with heart and passion, but I also want to learn strategy and self-control. They say you miss 100% of the shots you don’t take, but you also miss many of the shots that you fail to aim well. I want to utilize my strengths, improve upon my weaknesses, and take aim at worthwhile goals. Grandma may not always approve of the shots, the methods, or the outcomes, but that’s alright. What matters is that we learn to be the best version of ourselves. You are the one running the race. Nobody else can do it quite the same. So, stay loyal, stay true, and when needed, refine and turn that faucet to hot. But don’t full-out conform or sell out, because nobody can take the shot quite like you. Even if they tried, they’d probably be a mile wide and 20 degrees too cold. How does the process of self-improvement go for you? Can you explain how the journey of taking on your own advice or the advice of others to become a better version of yourself goes? Does the process of trial-and-error work for you? As in, do you learn best by doing and experiencing yourself? Or, how about the process of learning by being told by a wise and experienced person? Can you learn through a person you respect? Amazing Zach. Thank you for sharing. 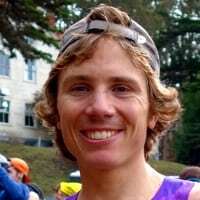 Funny enough I think we were all heart rooting for you during UTMB this year and inspired by your head and heart efforts. Keep going. Keep sharing. Keep writing. Scott, thanks for reading, supporting, and sharing your thoughts. I’ll try to keep doing my thing! Absolute gold! I see myself reading this article for many years to come. Thank you! So good. You hit the nail on the head. Thanks for the great thoughts. How can you be such a brilliant runner and write so beautifully. Cannot wait for your completion, 2019?? Hopefully grandmother will have more wise advice for you? And don’t forget to take the time to recognize and celebrate what you already are, along the way. We are amazing beasts! Everyone had their own reasons for running and I’m using this resource to help me find purpose. I am very much inspired by your heart based running (and writing). Great message Zach. Thank you and God bless. It’s true that what works for you won’t work for everyone. It took me a few years to find a way to take in calories during ultras. I started out using gels of various sorts but found that I couldn’t stomach them for more than 4-5 hours. Bananas didn’t work for me either. Through the advice of some veterans I found a mix that worked for me – and it included sweet potato, bacon, and chocolate bars. Zack writes really well – i would never pair this articel with the video of his epic finish at the NF 50! You guys should hire him – he is a natural journalist! ‘Measure twice and cut once’….. a carpenters approach to life translates well. Due diligence in planning, researching, assessing and putting together the appropriate resources goes a long way when taking the step of ‘trialing’ and ‘dialing in’ the right approach. Learn but always be yourself is the best advise. Thanks. I don’t want you to suffer ☆ but hear and see you shout moan breathe in the race “Miller VS Hawks” TNF 50 2016 made me just go out and run. And run hard. Keep up that running and writing your way!! !